To Cite: Dianat M, Saadatfard S, Badavi M, Ahangar Pour A, Sadeghi N. The Effect of Caffeic Acid Phenethyl Ester on Development of Left Ventricular Dysfunction in Cirrhotic Rats, Int Cardio Res J. Online ahead of Print ; 10(4):e9806. Background: Cardiomyopathy is one of the major complications of cirrhosis. Free radical scavenging and antioxidant substances can reduce cardiomyopathy and cardiovascular mortality of cirrhosis. caffeic acid phenethyl ester (CAPE) is one of the major compounds of polyphenols with anti-inflammatory and free-radical scavenging activities. Methods: In this study, thirty male Sprague-Dawley rats (200 - 250 g) were divided into three groups (sham, cirrhotic, and cirrhotic treated with CAPE). CAPE was administrated (1 μg/kg/day, ip) for 5 weeks. bile duct ligation (BDL) was applied in order to induce cirrhosis. Five weeks after surgery, left ventricular function was evaluated by Langendorff system, and data of the sham group were considered as ventricular function before the BDL surgery. For histopathological evaluation also, livers of all the rats were removed and processed for light microscopy. Then, all the serum biochemical parameters were measured. After all, the data were entered into the SPSS statistical software, version 18 and were analyzed using one-way ANOVA followed by LSD test. The data were presented as mean ± SEM and P < 0.05 was considered to be statistically significant. Results: The maximum rate of increase and decrease in ventricular pressure (± dp.dt-1), which was reduced by cirrhosis (P < 0.001) improved significantly by CAPE (P < 0.001). Conclusions: The findings indicated that CAPE improved the left ventricular function in cirrhotic rats. Thus, it may be considered to be a new therapeutic approach in future cirrhotic cardiomyopathy. Cirrhosis is associated with numerous cardiovascular abnormalities, which are often followed by chronotropic and inotropic dysfunction known as cirrhotic cardiomyopathy (1). Cirrhotic cardiomyopathy consists of systolic and diastolic dysfunction and electrophysiological abnormalities in the absence of any known cardiac diseases (2). This syndrome is characterized by portal hypertension and cirrhosis as well as intrinsic alterations in myocardial function. Several lines of evidence have supported some pathological etiologies for cirrhotic cardiomyopathy, such as abnormalities in the β-adrenergic signaling pathway, changes in cardiomyocyte membrane fluidity, and ion channels defect. Besides, many researchers have indicated that various compounds, such as nitric oxide (NO) and carbon monoxide (CO) that are elevated in cirrhosis, had negative inotropic effects on the myocardium (3). Moreover, many studies have demonstrated that impairment of the antioxidant defense system was involved in a number of pathological conditions, including cardiovascular diseases (4, 5). Caffeic acid phenethyl ester (CAPE) is the active component of the polyphenol purified from the hives of honeybees. The composition and properties of CAPE have been extensively investigated and reported to have many beneficial effects on human health, including reduction of cardiovascular diseases. Many researchers have also shown that CAPE compounds possessed a broad spectrum of antioxidant (6, 7), anti-inflammatory (7-9), anti-carcinogenic (10, 11), antiviral (7, 12), immunomodulatory (13, 14), and free radical scavenging properties (15) that protected organs against free radicals and oxidative stress. Furthermore, CAPE had protective effects on tissues, such as brain, heart (16, 17), and spinal cord (18), and was a potent anti-arrhythmic agent (19). CAPE also had a protective effect against carbon tetrachloride-induced liver (20) and kidney injuries in rats and mice (21). Many studies have indicated that impairment of the antioxidant defense system was engaged in cardiovascular diseases and that CAPE had a significant effect on scavenging free radicals. Therefore, we hypothesized that CAPE could play a striking role in myocardial dysfunction. This study aims to determine the effects of CAPE on the left ventricular function in cirrhotic rats. This study was performed on 30 male Sprague-Dawley rats weighing 200 - 250 g prepared by the research center for proliferation and maintenance of laboratory animals, Ahvaz Jundi Shapour University of Medical Sciences. The animals were kept in separate cages under standard laboratory conditions (25 ± 2°C and 12:12 hour light-dark cycle) with free access to food and water. The study protocol was approved by the local ethics committee of Ahvaz Jundi Shapour University of Medical Sciences. Chemical Agents: CAPE (C8221) was purchased from Sigma-Aldrich Company, Germany. Extra hepatic cholestasis was induced by double ligation. At first, all the animals were anesthetized by ketamine (50 mg/kg) and xylazine hydrochloride (10 mg/kg) (22). After a midline abdominal incision close to the sternum, the common bile duct was identified, a double ligature was made with 4 - 0 silk, and a cut was made between both ligatures (23, 24). The muscle and skin were then sutured separately with 3 - 0 silk. Sham-operated control rats also received the same laparotomy, except that the bile duct was not ligated and sectioned. This group was used for evaluation of the ventricular function before Bile Duct Ligation (BLD). It was previously shown that rats underwent typical histological biliary cirrhotic changes during the 5-week period after ligation. Accordingly, all the experiments were performed for 5 weeks postoperatively (25, 26). Then animals were randomly divided into three groups, namely sham-operated (sham) (n = 10), BDL, and BDL treated with CAPE. In the CAPE-treated group, CAPE was administrated daily (1 µg/kg/day, ip) for 5 weeks (19) and other groups received a similar volume of saline (16, 27). On the trial day, the animals were anesthetized with ketamine (50 mg/kg) and xylazine hydrochloride (10 mg/kg). After opening the chest, the hearts were rapidly excised and placed into a petri dish containing ice-cold oxygenated modified Krebs-Henseleit Solution (KHS). After being washed with ice-cold KHS and arrested, the hearts were cannulated via the ascending aorta and immediately transferred to Langendorff system. A modified KHS of the following composition (mM): NaCl 118.4, KCl 4.7, MgSO4 H2O 1.2, KH2PO4 2H2O 1.2, NaHCO3 25, CaCl2 2.5, and glucose 11.1 in distilled water retro perfused the aorta. This solution was maintained at 37°C, bubbled with 5% CO2 and 95% O2, and perfused the isolated hearts via peristaltic pump (Gilson-France) at a constant flow rate (4 mL/min). The maximum time between the excision of the heart and the beginning of perfusion was 2 minutes (28). To record the left ventricular pressure (LVP), a latex balloon filled with water was placed in the left ventricle and was connected to a pressure transducer (Power lab 8/30 AD Instrument, Australia). After the stabilization period (30 minutes with a diastolic pressure between 1 - 6 mm Hg), left ventricular diastolic pressure was increased by 10 mmHg every 5 minutes, reaching 10, 20, 30, and 40 mmHg.10 For each diastolic pressure, the maximum rate of pressure rise (+dP/dT max) and fall (-dP/dT max) was calculated as the first derivation of the LVP (28). After opening the chest, blood samples were collected in tubes and the sera were removed by centrifugation at 3000 rpm for 5 minutes. Prior to determining the biochemical parameters, all the serum samples were kept at 4°C. Serum aspartate aminotransferase (AST), Alanine aminotransferase (ALT), and Alkaline phosphatase (ALP) were checked with an AU600 multiparameter analyzer (Olympus, Hamburg, Germany). Additionally, serum bilirubin was measured as a marker to show the occurrence of cholestasis (27, 29). Then, total and conjugated bilirubin were tested by kits (pars azmoon, Iran) through colorimetric method using an auto-analyzer (Olympus, Hamburg, Germany) (30). Livers of all the rats were removed immediately after the blood collection process. Then, liver tissue specimens were washed twice with a cold saline solution, placed into glass bottles containing formalin 10%, and stored at 25°C for histopathological examination (31). The data were presented as mean ± SEM and were analyzed through one-way analysis of variance. In case of significant difference, comparisons were made using post-hoc (LSD) test. All the analyses were performed using the SPSS statistical software, version 18) and P ≤ 0.05 was considered to be statistically significant. 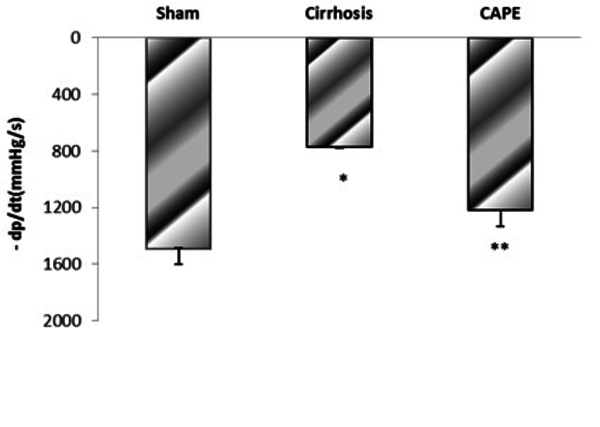 Serum levels of AST, ALT, and AlP significantly increased in the cirrhosis rats (P = 0.001) compared to the sham group. However, a significant reduction was observed in ALT (P = 0.038), AST (P = 0.0001), and ALP (P = 0.008) in the CAPE-treated group compared to the sham rats. Moreover, conjugated and total bilirubin levels were significantly higher in the cirrhotic and CAPE-treated groups than in the sham group (P = 0.001). However, no significant difference was found between the cirrhotic and CAPE-treated groups regarding bilirubin levels (P = 0.999) (Table 1). Significantly different compared to the sham group (P < 0.01). bSignificantly different compared to the sham group (P < 0.05). Values are expressed as mean ± SD (n = 10). The results of conventional histopathological examination confirmed the protective effects of CAPE on cirrhosis induced by BDL, as indicated by the biochemical data. 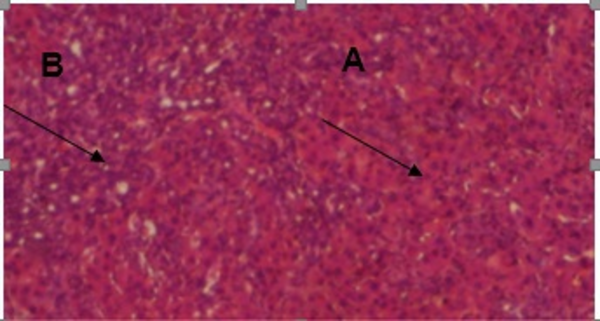 In this regard, livers of the rats in the sham group showed a normal histological appearance (Figure 1), whereas those of the rats with BDL showed classic histology of cirrhosis, coagulated necrosis, fibrosis, deposition of connective tissue, and formation of regenerative nodules (Figure 2, 3). Nevertheless, these changes decreased in the CAPE-treated group. Figure 2. 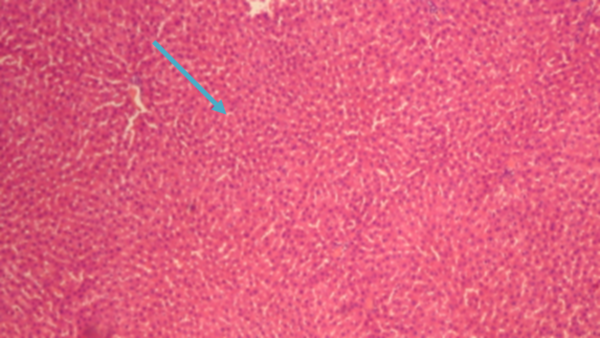 Liver section of a rat after BDL classic cirrhotic appearance with the presence of coagulative necrosis, mononuclear cell infiltration (small arrows), hemorrhage (h), microvesicular steatosis, and hydropic degeneration (large arrow); hematoxylin eosin staining; magnification × 100. Based on the results, BDL-induced cirrhosis significantly reduced maximum and minimum rates of pressure rise (± dP/dT) compared to the sham group (P = 0.048). Yet, ± dP/dt was completely improved by CAPE (P = 0.002) (Figure 4 and 5). Values have been expressed as mean ± SEM. * Significantly different compared to the sham group at P < 0.05. ** Significantly different compared to the sham group at P < 0.01. Values have been expressed as mean ± SEM; * Significantly different compared to the sham group at P < 0.05; * Significantly different compared to the sham group at P < 0.01. 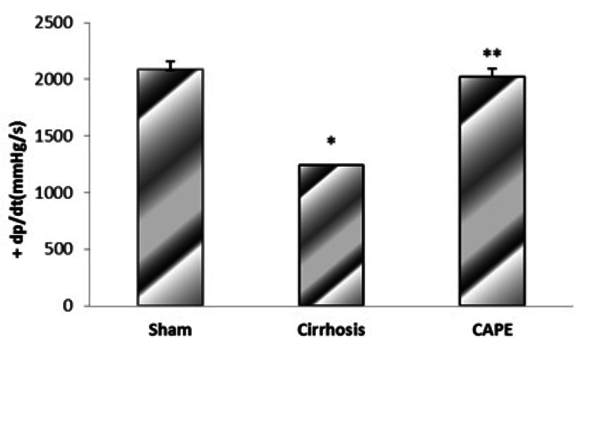 The results of the present study showed that treatment with CAPE caused a partial correction of liver enzymes, contractility, and tissue injuries induced by cirrhosis, but had no effects on conjugated and total bilirubin levels. Previous studies indicated that closure of the bile duct through lipid peroxidation caused disorders in TNF-α, IL1-β, IL-6 cytokines, and necrosis (30). In the current study, serum aminotransferases as sensitive indicators of damage to hepatocytes were evaluated to determine the degree of inflammation (32). Coban et al. reported that oxidative stress associated with lipid peroxidation was involved in development of liver damage in cirrhotic rats by BDL (33). Additionally, other studies demonstrated that CAPE prevented the formation of reactive oxygen species (ROS) and Malondialdehyde (MDA), as one of the secondary products of oxidative stress that is formed during lipid peroxidation and is one of the factors of toxic ROS in rats after BDL (18, 34, 35). Thus, reduction of aminotransferases found in the CAPE-treated group in our study can be associated with the antioxidative effect of CAPE. Moreover, a previous study showed that CAPE injection (2.84 mg / kg for 4 weeks) reduced the total and conjugated bilirubin levels in liver toxicity induced by carbon tetrachloride in rats (34). In our study, however, CAPE could not change the elevation of bilirubin levels, which might be due to the difference in the administrated doses. Cirrhotic cardiomyopathy is characterized by heart dysfunction caused by cirrhosis in the absence of any known cardiovascular diseases, such as coronary artery disease, congenital or valvular heart disease, and hypertension (2). Indeed, heart is one of the body organs with a high oxygen consumption rate and slow turnover of antioxidant enzymes. Thus, it is highly liable to oxidative damage. On the other hand, cirrhosis not only increases the production of free radicals, but also impairs the antioxidant defense system (36). NO and CO are produced in the cirrhotic heart by increased inducible NO synthase and hemoxygenase, respectively. Many researchers have asserted that stimulation of the NO pathway prompted an increase in cytokines in cirrhosis (30). For instance, increased Tumor Necrosis Factor-α (TNF-α) and cyclic Guanosine Monophosphate (cGMP) contents have been reported in the BDL model of cirrhotic rats (3). These findings supported the role of NO and CO in mediating the reduced contractile response in cirrhosis. Both NO and CO stimulate guanylate cyclase to produce cGMP, which in turn phosphorylates protein kinase G to inhibit calcium influx into the cytosol of the cardiomyocyte (37). Liu et al. indicated that activation of the hemeoxygenase-carbon monoxide pathway played a significant role in pathogenesis of cirrhotic cardiomyopathy in rats (29). Heme oxygenase (HO) degrades heme to biliverdin and CO and then, CO depresses cardiac contraction through cGMP. Furthermore, proinflammatory cytokines increase their own production as well as the synthesis of small inflammatory mediators, such as platelet-activating factor (PAF) and oxidative radicals. These results suggest that increased CO production caused by HO activation might play an important role in the pathogenesis of cirrhotic cardiomyopathy (29). Ward et al. investigated the status of cellular Ca2+-regulatory system in a rat model of cirrhotic cardiomyopathy. Their results revealed that L-type Ca2+ channels protein expression was reduced and the peak of inward Ca2+ current was significantly less in cirrhotic rats compared to the controls. Thus, they concluded that reduction of cardiac contractility in cirrhotic cardiomyocytes was caused by Ca2+ regulatory system dysfunction (38). Chang et al. disclosed that CAPE reduced the occurrence of reperfusion-induced ventricular fibrillation and decreased LVP in isolated hearts. In papillary muscles, CAPE shortened the potential duration of operation and reduced both the maximum upstroke velocity and contractile force. In single ventricular myocytes, CAPE shortened this period whereby the Ca2+ transient amplitude was reduced. Patch-clamp experiments revealed that CAPE produced a use-dependent decrement in L-type Ca2+ current (ICa, L) (IC50 = 1.1 μM) and Na+ current (INa) (IC50 = 0.43 μM), which caused a negative shift of the voltage-dependent inactivation and a delay in recovery from inactivation. CAPE also decreased the delayed outward K+ current (IK) slightly without affecting the inward rectifier K+ current (IK1). In the present study, CAPE as an antioxidant (39) could improve myocardial contractility determined by dp/dt, which was attributed to the above-mentioned mechanisms (40). Therefore, these findings indicated that CAPE could reduce oxidative stress in cholestatic rats through interfering with the free radical species (34). Besides, several studies have demonstrated that this substance led to a decrease in liver damage following bile duct closure in rats. Another study reported that CAPE had anti-inflammatory properties by inhibiting the release of arachidonic acid from cell membranes. Reduction of arachidonic acid metabolism was also observed in cultured human oral epithelial cells as well as in carrageenan-induced inflammation of air pouch model in rats. The anti-inflammatory properties of CAPE have been attributed to suppression of eicosanoid synthesis (8). Since NO synthesized by inducible nitric oxide synthase (iNOS) has been known to be involved in inflammatory responses, it seems that modulation of NO synthesis can be a new approach for treatment of inflammatory diseases. CAPE has been identified to show anti-inflammatory activities (25). Other studies have shown that CAPE might exert its anti-inflammatory effect by inhibiting the iNOS gene expression at the transcriptional level through suppression of NF-κB activation and direct inhibition of the catalytic activity of iNOS (35, 41). Hence, reduction of necrosis, edema, and degenerative changes in the liver tissues observed in our study was caused by the anti-inflammatory effect of caffeic acid. Since other studies have shown that cardiovascular complications in cirrhotic patients resulted from changes in ions permeability (such as potassium and calcium), ion channels behavior (such as L-type calcium channel), cardio depressant agents, and increased free radicals (42), it has been suggested that CAPE prevented these complications with free radical scavenging, antioxidant, and anti-inflammatory properties. The findings of the present study indicated that CAPE improved the left ventricular function in cirrhotic rats. Thus, it may be regarded as a new therapeutic approach in future cirrhotic cardiomyopathy. This study was extracted from Samira Saadatfard’s M.Sc. thesis. Hereby, the authors would like to acknowledge the scholarly and financial support of the physiology research center of Ahvaz Jundishapour University of Medical Sciences (grant No. PRC-61). Authors’ Contribution: Mohammad Badavi: Conception and design of the study (50%), drafting, critical revision for important intellectual content (80%), final approval of the study, provision of the study material (30%); Najmeh Sadeghi: collection, assembly, and possession of the raw data (doing experiments), provision of the study material (20%), critical revision of the manuscript for important intellectual content (10%); Mahin Dianat: critical revision (10%), provision of the study material (20%), analysis and interpretation of the data (10%), statistical expertise (10%), obtaining funding for the study (10%), conception and design of the study (50%); Samira Saadatfard: study design (60%), provision of the materials, interpretation the data (100%). Funding/Support: This research was supported by physiology research center (PRC) of Ahvaz Jundishapour University of Medical Sciences. Implication for Health Policy/ Practice/ Research/ Medical Education: These results may be considered as a new therapeutic app roach in future cirrhotic cardiomyopathy.